Mr. Berman is Professor of political science at the University of California Davis and the author of three well-received books on Vietnam. 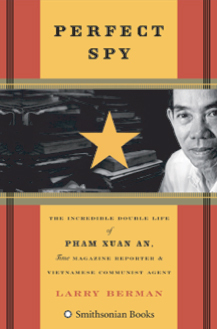 His latest book is Perfect Spy: The Incredible Double Life of Pham Xuan An, Time Magazine Reporter and Vietnamese Communist Agent (Smithsonian Books/HarperCollins, 2007). He made more than a dozen trips to Vietnam in the course of writing this book. Why did one of the great spies of our century allow me to be his American biographer? During the Vietnam War, Pham Xuan An was a highly respected Time Magazine reporter who turned out to be a spy for the North Vietnamese. He was a trusted source for the era’s best known reporters; his circle extended well beyond journalism to include the CIA’s Lou Conein, Edward Lansdale and William Colby. He was friends with the most notable South Vietnamese politicians and generals. Working for Time provided the perfect listening post and information access point for a spy. Pham Xuan An was given protection and support by Time Magazine, a leftist magazine that favored the communist enemy during the Vietnam War. Thus, An traveled wherever American journalists traveled, and most US leftist journalists were his comrades, leftist enemies of the USA and South Vietnam. An and other "American" journalists helped win the war for North Vietnam. The American journalists who shielded An, and no American military or agency employee dared threaten his "right" to be included in every US high level briefing, also shielded numerous other communist spies (yet unnamed). The US journalists were traitors then and they are traitors now, in Afghanistan and Iraq. They are still shielding anti-American spies. This time they have Middle Eastern names. Once again, no military or political entity in the US government dares question the right of foreign spies, protected by US press credentials, to be there! Inside, where they can get the most information and do the most harm. Who let them in as embedded reporters after all the damage so-called American journalists did during the Vietnam War? Incompetent US generals. Leftist generals appointed by Clinton or recruited by a Clinton appointee. Once again the journalists are betraying America as they do a hatchet job on the US war effort. Once again, as in Vietnam, they shield and promote high level enemy spies and they are, again, causing the defeat of America. Those of us who know what is happening have only contempt for those of you, who are non-leftists and pro-America. Why? Because you have been made fools of twice. There is only one place on the internet where Americans can get real information about the traitors and leftist saboteurs who have cost America numerous victories since the Korean War. It is www.quikmaneuvers.com a place where there are over 240 different e-books available with hard driving facts about America's traitors and incompetents in high places and low places (the media).